What can you do to get your resume noticed? How can you make the cut and get selected for an interview? You might have been rejected for a job before a prospective employer even laid eyes on your resume. It's a harsh reality, but the advent of online applications and digital resume submissions have made it easier for applicants to apply for jobs, expanding the number of resumes that employers receive. To screen this large volume of resumes, many employers use software to help them to conduct an initial screening of resumes. Almost all large companies utilize automated systems to screen candidates, and a significant number of middle size organizations do the same. Companies with less than 50 workers are much less likely to use such a system. These Applicant Tracking Systems (ATS) screen out or reject an estimated 70 percent or more of the resumes submitted either because the documents don't reflect the desired qualifications or are formatted in a way that the system can't digest the information. Paying careful attention to how you format and compose your resume can increase your chances of moving past this initial screen. Here's how to beat Applicant Tracking Systems and get selected for a job interview. Make sure your application contains keywords relevant to the job you're applying to. Review the qualifications listed and implied in the job advertisement. Make sure you also visit the company website to determine if a more detailed job description is available. If there's not much information available, you can review similar job vacancies on major job sites like Indeed.com to gain further insight. Or, interview professionals in your target field and inquire about the keywords and jargon they would recommend using given the knowledge and skills that are most highly valued in the field. Make a list of words and phrases used to describe the ideal candidate, and incorporate them into your job application materials. You can use the most critical keywords more than once if possible, but don't go overboard. There will be no penalty for repetition and systems often tally points for each mention of a key asset, up to a realistic point. Incorporate a skills section or a summary of qualifications to list keywords for assets that you might have difficulty fully supporting through descriptions of the positions you have held. Generic resumes are the enemy of Applicant Tracking Systems and will be the first documents screened out. Be sure to tailor your resume to each job that you are targeting. Incorporate as many of the keywords and phrases that you have identified in the job description as possible, though make sure your writing still sounds natural and reads well. Don't leave off the dates of your employment. Systems may be screening based on the amount of experience required for a particular job. Keep the format simple and avoid fancy graphics. Plain text Word documents are usually the most easily digested by Automated Tracking Systems. PDF documents can be troublesome for Automated Tracking Systems. Use a font size of at least 11 points and margins of at least one inch on all sides. You can usually utilize a somewhat longer document than the traditional 1 - 2-page resume since length doesn't typically matter for ATSs. Most systems will generate a summary of your resume data for decision-makers and not yield your actual resume. However, some employers will retrieve your actual document and view it online. To account for either case, use a simple but attractive format and avoid unnecessary and flowery language that will distract the reader from focusing on your most essential qualifications. Some employers will also use software to search the web and assess your social media presence. Cultivate your brand online. Make sure the facts represented through your social media profiles are consistent with your resume and applications. Develop and save a "human eyes only" version of your resume for small employers, when you are dropping off resumes or networking. You will still also want to bring a few extra copies of your traditional resume to your interviews. Don't put all your eggs in the automated online application basket. Regardless of how well your resume is designed to penetrate Applicant Tracking Systems, you should still place a high priority on networking strategies. 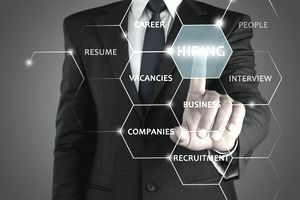 Given the flood of online resumes submitted to employers, it helps to have advocates inside organizations pointing out their view that you are a viable candidate. Most employers have an employee referral program, and an endorsement by a member of their staff might enable you to bypass an ATS screen.